Maybe it’s because I’m aging, work with older adults or have lost friends and family, but I’m increasingly aware of how limited our moments are in life. I want to maximize my moments. Whether it’s being able to remember better, truly enjoy or impact others in a positive way, all our moments improve when we are motivated. Enter the Spring into Wellness Challenge! 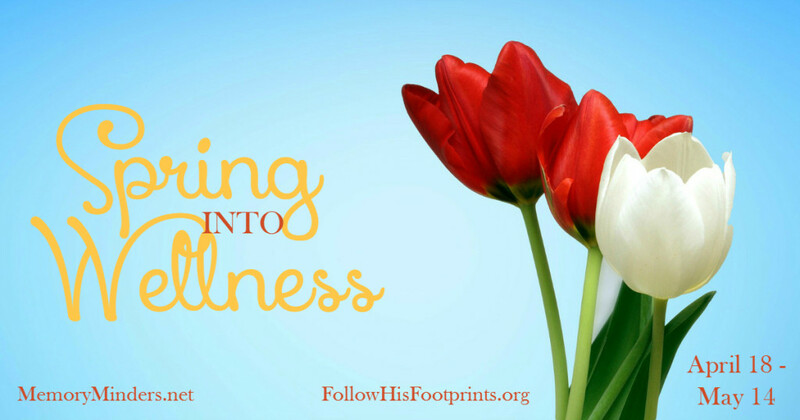 Welcome to the first installment of the Spring into Wellness Challenge. Sign up (or email me & I’ll sign you up) if you haven’t already done so to receive additional posts delivered directly to your inbox. We’ll be challenging each other for the next four weeks to a deeper level of wellness in mind, body and soul. As I help others with their mind wellness, I clearly see a link between mind and body wellness. But there’s a deeper component too-soul wellness. We’ll dig into all of this and more with encouragement, tips and inspiration over the next four weeks. It’s not too late, sign up and get ready for a challenge! Have you ever remembered something as though it’s happened already yet you know it never has? Some call this déjà vu, but I like to think of these as mindful soul moments. It’s one way our soul speaks to us. This happened to me the other day and made me appreciate my amazing brain. It remembered something which hadn’t even happened yet! I saw a fictionalized dramatization of this on TV the other night. A character with other worldly power to see the future was able to make others do the same. The heroes wanted to use this to prevent something bad in the future; while the scientists explained the impossibility of this. While I understood the improbability on some level, it more importantly confirmed how this life is not all there is. Yes, we have a certain number of moments. But there’s more to life that any of us will ever fully realize. One thing I am sure of is I want to make my moments count. I try to practice what I preach as the saying goes. I engage my mind and body towards wellness. But I can’t predict the future and life can change in an instant. When or if life changes, I want to be confident I maximized my moments. 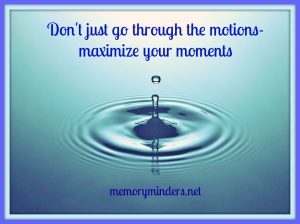 So on this first Mindful Monday of the Wellness Challenge, let’s think on this: How can we maximize our moments today? What memories do you want to take away from this day? Will they be all about work, to-do lists and what we HAVE to do? Certainly everyday has these types of moments. But let’s choose to consciously make some moments memorable. Let’s spend time with someone we care about, encourage a child or someone in need, make a new friend or step out of our comfort zones to challenge ourselves and others. These small acts create ripples into other people’s lives. Not only are we making our moments more memorable but we are doing the same for others. 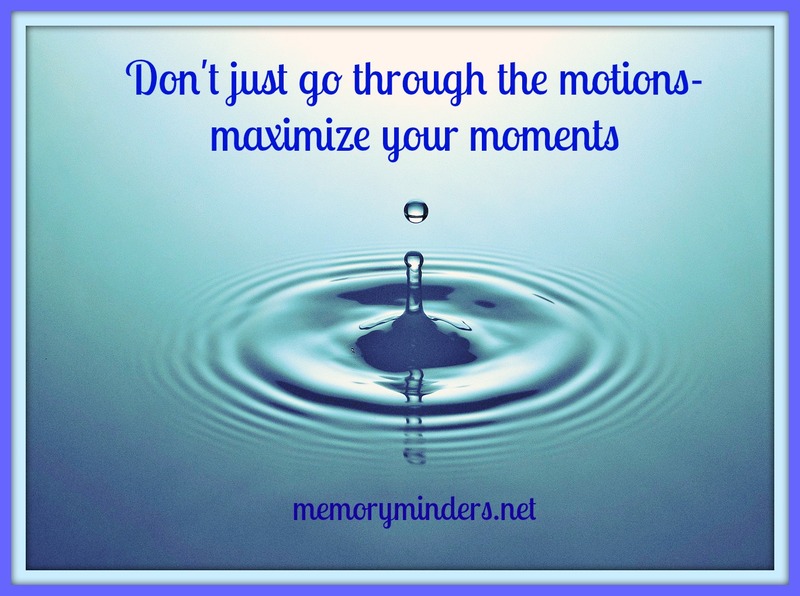 When consciously motivated to maximize our moments, our perspective shifts. Life becomes about what we want to do instead of what we have to do. We think about others more than ourselves. We live the life we are meant to, not a life of going through the motions. Challenge yourself today to maximize your moments. Motivate yourself and others by seeing your mind, body and soul wellness as a gift and maximize it. See if it makes a difference for you today. Chime in below with a comment or join me on Facebook or Twitter to continue the conversation on how we can challenge ourselves and each other to maximize our moments! Thank you for this challenge! So excited to see what this will bring. On a side note….I didn’t know you watched Agents of Shield! It is the only show I watch – well, that and cooking shows! Yes, I’m excited to see where this all takes us too! And yes, great show and I watch cooking shows of course too! Thanks my friend!! Just thinking about maximizing my moments has already given me a perspective shift. Now, I just need to remember it throughout my day! That’s the challenge. If not my to-do list gets the upper hand. So true! It’s about making the to-do list work for us to help us maximize our moments, not the other way around! Thanks Rachel!